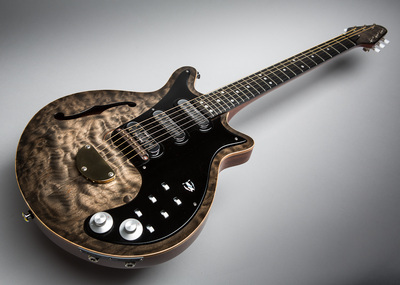 Following feedback from Brian in rehearsals for the first Queen + Adam Lambert tour, Pete Malandrone and I decided to give the BM Archtop a major revision for the 2014 tour. 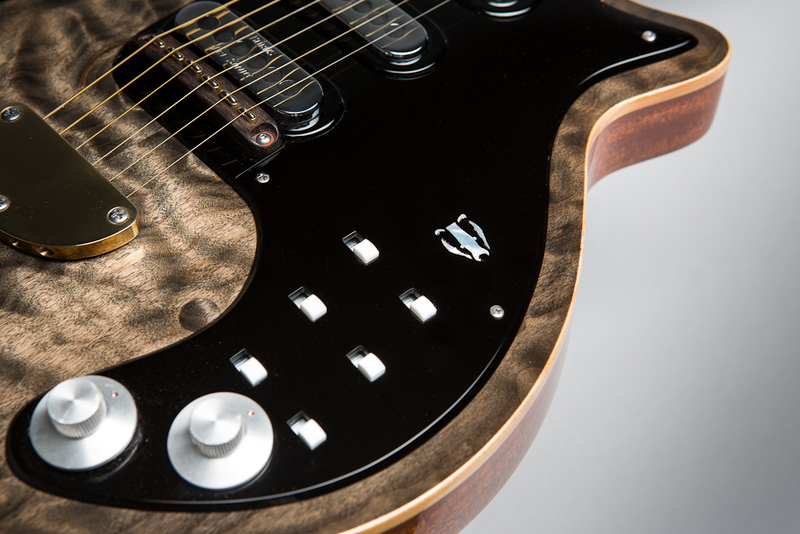 The Mk1 guitar was initially built as an experimental prototype, but for Brian, it was just too much of a departure from his live sound. So we planned a series of modifications and improvements to bring the guitar into line with what Brian wanted. Firstly it had to have a third Burns Trisonic added, and Brian's sliding switch arrangement. Secondly, the piezo bridge had to be replaced with something a little more authentic sounding. To mount this additional hardware on an arched top was the biggest problem. 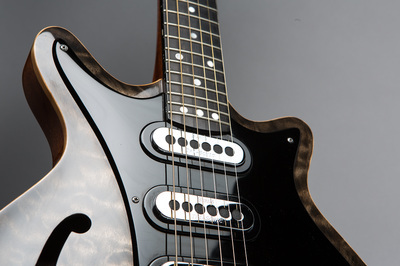 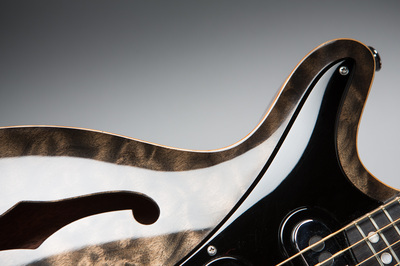 The only REAL way of doing this properly was to fabricate and hand form an arched acrylic pickguard that followed the contours of the top with the profile of the original. 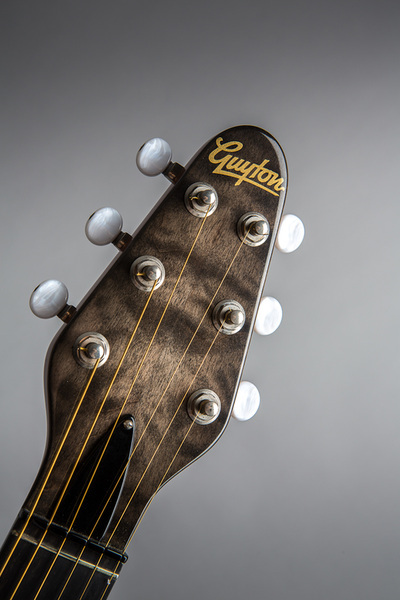 The acoustic bridge was fabricated from a single piece of Brazilian Rosewood, with slots machined to accommodate the saddles and to cater for overall intonation. 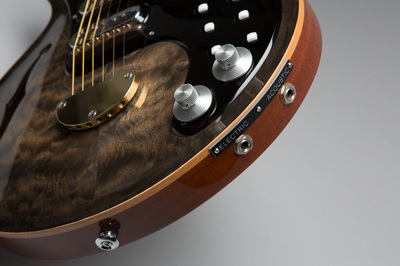 The piezo saddles are manufactured by L.R.Baggs. 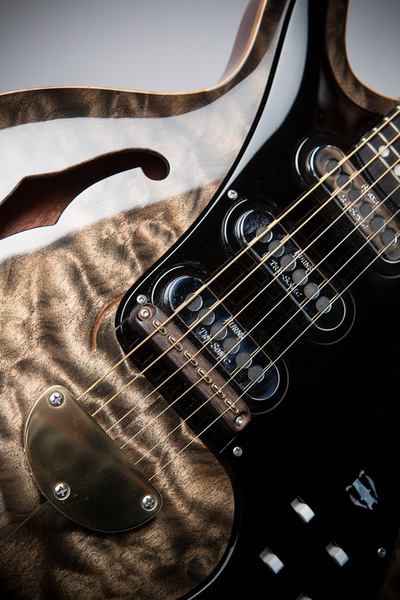 During the work, I decided to refinish the guitar's maple top. 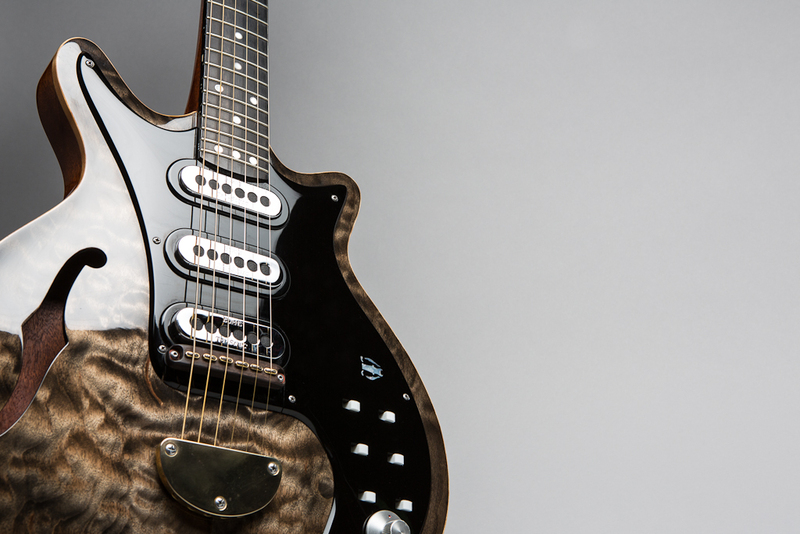 After stripping the original finish, I stained it black, sanded it back and applied a translucent black sunburst. Because the maple was a fairly dark colour it gave the top a series of gold/bronze highlights that really brings out the depth and beauty of the quilted figuring. 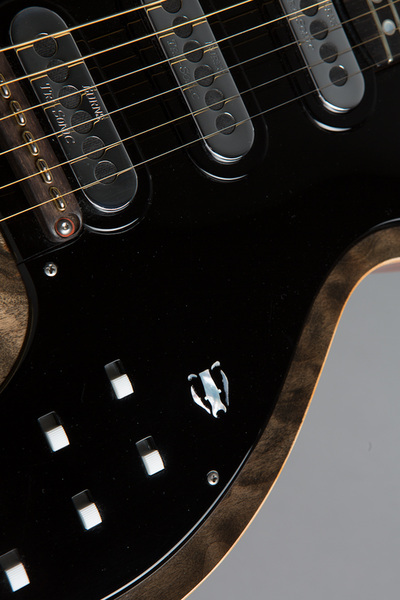 The finishing touch to the guitar was to add a small Mother of pearl Badger's face inlay into the pickguard. Once Brian had taken delivery of his new guitar it was quickly put to use as the 'Crazy little thing called love' guitar. 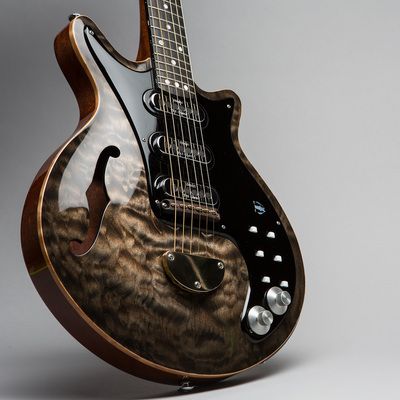 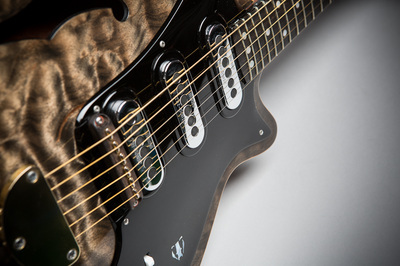 But, because of it's inlay, I think it will always be known as the 'Badger' guitar. 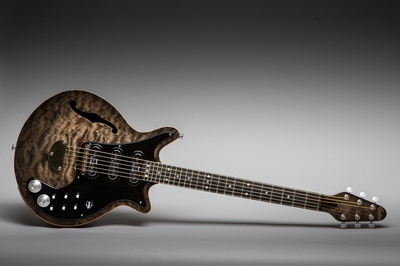 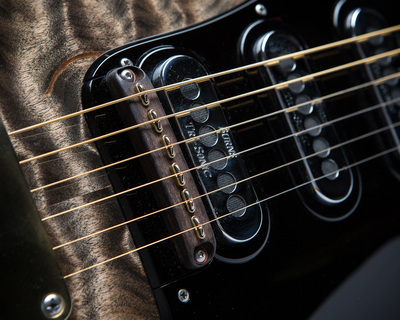 This guitar has now been released as a strictly limited edition of 5 guitars. Production will start in February 2015 with completion around September/October 2015.